Manage your clients, share them with your colleagues, or invite them to work with you in the cloud. 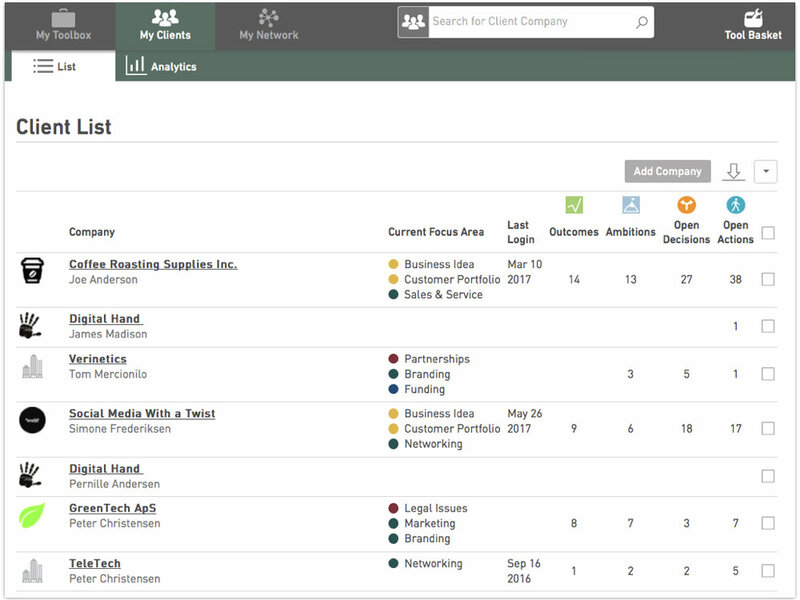 On GrowthWheel Online you cancreate client companies and either use the platform to just track your work with them, or invite the client companies so you have a platform where you can work together. The Client List gives you an overview of all your clients and what they are working on. When you create a new client company, you can choose to invite the client team immediately, or do it later on. Both you and your client can invite additional team members, if the client wants to share the work with other owners or employees in their business. You can invite your colleagues to work with your clients. This way you can collaborate and provide the clients with your combined resources.